In many of my past journal entries I have talked about El Niño or ENSO, so what is it? Well El Niño is an oscillation of the ocean-atmosphere system in the tropical Pacific having important consequences for weather around the globe. Among these consequences is increased rainfall across the southern tier of the US and in Peru, which has caused destructive flooding, and drought in the West Pacific, sometimes associated with devastating brush fires in Australia. Observations of conditions in the tropical Pacific are considered essential for the prediction of short-term (a few months to 1 year) climate variations. To provide necessary data, NOAA operates and assists in the TAO buoy project, which measure temperature, currents and winds in the equatorial band. These buoys daily transmit data, which are available to researchers and forecasters around the world in real time. In normal, non-El Niño conditions the trade winds blow towards the west across the tropical Pacific. These winds pile up warm surface water in the west Pacific, so that the sea surface is about 1/2 meter higher at Indonesia than at Ecuador. The sea surface temperature is about 8 degrees C higher in the west, with cool temperatures off South America, due to an upwelling of cold water from deeper levels. This cold water is nutrient-rich, supporting high levels of primary productivity, diverse marine ecosystems, and major fisheries. Rainfall is found in rising air over the warmest water in the west Pacific, and the east Pacific is relatively dry. The track of the KA’IMIMOANA for TAS Braun’s science cruise (in light blue). During El Niño, the trade winds relax in the central and western Pacific leading to a depression of the thermocline in the eastern Pacific, and an elevation of the thermocline in the west. This reduces the efficiency of upwelling to cool the surface and cut off the supply of nutrient rich thermocline water to the euphotic zone. The result is a rise in sea surface temperature and a drastic decline in primary productivity, the latter of which adversely affects higher trophic levels of the food chain, including commercial fisheries in this region. The weakening of easterly trade winds during El Niño is also evident. Rainfall follows the warm water eastward, with associated flooding in Peru and drought in Indonesia and Australia. The eastward displacement of the atmospheric heat source overlaying the warmest water results in large changes in the global atmospheric circulation, which in turn force changes in weather in regions far removed from the tropical Pacific. Unfortunately, NOAA recently issued an unscheduled EL NIÑO advisory due to El Niño conditions that developed in the tropical Pacific and are likely to continue into early 2007. Ocean temperatures have increased remarkably in the equatorial Pacific during the last two weeks. “Currently, weak El Niño conditions exist, but there is a potential for this event to strengthen into a moderate event by winter,” said Vernon Kousky, NOAA’s lead El Niño forecaster. During the last 30 days, drier-than-average conditions have been observed across all of Indonesia, Malaysia and most of the Philippines, which are usually the first areas to experience ENSO-related impacts. This dryness can be expected to continue, on average, for the remainder of 2006. Also, the development of weak El Niño conditions helps explain why this Atlantic hurricane season has been less active than was previously expected. El Niño typically acts to suppress hurricane activity by increasing the vertical wind shear over the Caribbean Sea region. However, at this time the El Niño impacts on Atlantic hurricanes are small. So for the past month I have been on the cutting-edge research that assists physical scientists with data that will create ENSO forecast models to improve our understanding of underlying physical processes at work in the climate system. 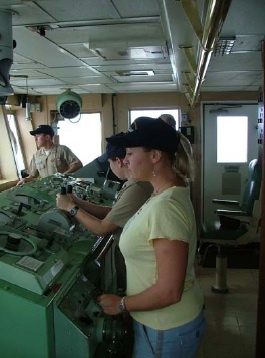 On our way into Kwajalein, I got to steer the ship. Didn’t go very straight but not bad for my first time. I want to give a HUGE thank you to Commanding Officer Mark Pickett; Executive Officer Robert Kamphaus; Field Operations Officer Rick Hester; the Junior Officers, the science team and the crew of the KA’IMIMOANA for the amazing opportunity I’ve had the honor to experience.